As Nigerians warm up for Presidential election this month, about 400,000 children in the northeast are at the point of death, owing to malnutrition. The northeastern part of Nigeria has been ravaged by the deadly Boko Haram terrorists for over 10 years now, and the region is faced with various humanitarian disasters with women and children worst hit by the violence. 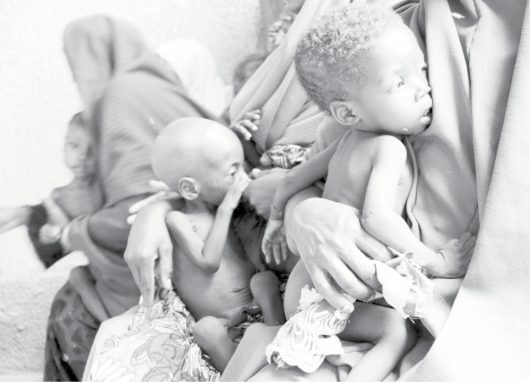 Experts believe that the crisis has contributed a lot to the increase in malnutrition in the region. But another surprising reason according to a public Affairs Analyst, Hajiya Maryam Garba Hassan, who is familiar with the events in the northeast, is the disagreement over exclusive breast feeding by some scholars in northern part of the country. According to her, “educating women about issues of exclusive breast feeding is a welcome development in the north east, but the likely challenge that may hinder achieving the desired goal is the issue of exclusive breastfeeding which most, if not all school of thoughts are against. “However, research has shown that breast milk contains about 60% water, a revelation that scientists believe exclusive breast feeding should be adopted in the first six months to prevent child illnesses associated with water. But some scholars in the region are of the believe that exclusive breast feeding causes sterile and impotence among baby boys when they grow up. Some Islamic or Muslim scholars are against it with some of them believing that it makes a child become temperamental in the future”. “Although it is not stated in the holy Qur’an or the hadith of Prophet Muhammad peace be upon him, but scholars are still preaching against exclusive breast feeding which they believe is a western propaganda or agenda to reduce the population of Africans by reducing the chances of male children having kids in the future”. She said there is need to invest heavily in the region to save many children in the northeast from dying. On her part, a military medical personnel in the northeast, Who does not want her name in print told Peoples Daily that the situation is critical with breast feeding mothers in the eye of the current challenges. “This is because malnutrition is a medical emergency for both mother and child. “A malnourished mother will not be able to adequately breast feed the baby. Also, the baby is more at risk of developing medical problems which can be fatal since most of the organs are still developing. It also increases the risk of infections, organ failure which affects their growth and productivity in life. “Insurgency in the northeast has denied breast feeding mothers so many opportunities. Women here don’t have access to proper diet, and they are always scouting for what to eat or rely on food brought in by NGO’s and well meaning individuals. I must say that UNICEF’s presence is being felt here among others. She added that the women have poor breast feeding culture. “They don’t see it from the exclusive angle. To them, breastfeeding does not have any rules. They see exclusive breastfeeding as a punishment. Based on their perception, we try to educate them and tell them the proper things to do. Meanwhile, a Nutrition Consultant, Davis Bamidele said a state of emergency has been declared in the northeastern part of the country to address malnutrition. Speaking on the critical situation in the northeast, he revealed that over $100 million is needed to stamp out the rampant cases of malnutrition in northeastern states of Yobe, Borno and Adamawa states alone. The expert made the revelation in December, in Yola, Adamawa state, during a media dialogue with journalists/OAPs on child malnutrition in northeast. The dialogue was organized by the Child Rights Information Bureau (CRIB) of the Federal Ministry of Information and Culture in partnership with the United Nations Children Funds (UNICEF) to enlighten journalists about the high level of malnutrition in the northeast. Specifically, he said children malnutrition in Nigeria is prevalence in the northern region, with over 25 million under 5 children suffering from malnutrition while over 10 million affected by stunted growth. He said “The situation and indices of malnutrition in the North Eastern part of Nigeria remains precarious, the under five mortality rate in these areas exceeds the threshold of 10,000 deaths recorded among children under the age of five daily”. He further identified insurgency, poverty, lack of education, gender issues amongst others as the drivers of malnutrition in the region. “Insurgency in the region maybe seen as the major driver of malnutrition as it has over the years led to high insecurity, negative coping strategies, increased spread of endemic diseases and destruction of access to quality water and optimal sanitation”, he added. Bamidele said that lack of care and show of love is also an important factor to consider in the fight against malnutrition, saying that most infant deaths results from lack of care from parents. On his part, the Deputy Director, CRIB in the ministry of information, Olumide Osanyinpeju, stressed that combating malnutrition is imperative to the control of infant mortality in Nigeria, adding that concerned effort is required to ensure total eradication of malnutrition in Nigeria. According to him, “Malnutrition is a large burden to a country, and tackling malnutrition entails empowering and educating the people. Also, improved nutrition is the key to improved National and human development”. “Addressing nutrition is one of the ways sustainable development goals can be achieved, therefore investment in nutrition will help reduce the trend of malnutrition which had been ensured by the creation of this dialogue”.